There will be prizes. 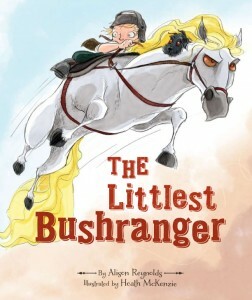 A piece of Heath McKenzie’s artwork from The Littlest Bushranger, a picture book assessment by Alison Reynolds, 2 free passes direct to an editor’s desk (you get to skip the slush pile), copies of The Littlest Bushranger. Get ready to jump on board! Kelly, I’ve loved the questions on this wild ride. They’ve really made me think about my process, which is a valuable thing! Can’t wait to gallop into the Bell homestead! I’ve ordered in a fresh bag of oats and will meet you and the Littlest Bushranger by the coral fence on the 12th, Alison. Can’t wait for your visit. I’m excited, Dimity. And so happy for you to be on the wild ride too!